Every little thing a baby does is delightful. Every little move. Every smile. Every squeeze of the fingers, curl of the toes. Everything. The latest ultrasound technology shows us that all this delightful activity starts long before a baby is born. Yawns, for instance, keep a baby busy during the sixth month of gestation and this delightful activity has been caught on video for all to see. British researchers at northern England’s Durham and Lancaster Universities used 4-D ultrasound scanning technology to determine the difference between yawning, if it indeed does occur during gestation, and random movements of the baby’s mouth. Four-dimensional imaging adds the dimension of real time to the more familiar 3-D imaging that records a view from side to side, back to front, and top to bottom. Turns out, yes, babies do yawn in the womb. Nadja Reissland, who led the 2012 study, says babies don’t yawn the way the rest of us do. They don’t yawn because they are sleepy or because another person’s yawn triggers their own (although the video is likely to trigger a yawn from its viewers). She suggests yawning in utero may be a process that helps the developing brain mature effectively. The Reissland research team recorded 4D scans of 15 healthy babies in the womb. Eight of the babies were female, seven of them male. It became clearly evident that babies do actually yawn during gestation. Yawns were identified as open mouth movements that lasted longer than simple opening and stretching of the mouth. Knowing babies are yawning in the womb, however, doesn’t explain why they are doing it or how it is important to fetal development but the research team expresses the belief that fetal yawning serves a purpose. Interestingly, fetal yawning begins around week 24, starts to decline around week 26, and the yawning stage is pretty much over by week 36. This pattern remained steady throughout the study, with no gender differences noted. The 4-D research suggests monitoring of fetal yawns could one day become a way to assess the health of a developing baby. Babies in the womb are busy little creatures. They stretch, as many mothers will attest, and they swallow and hiccup, too. And every little thing they do, every little kick, stretch, or yawn is absolutely delightful. Delightful to happy parents eagerly awaiting the baby’s birth and to the scientific researchers who study every little activity going on in there, even before the baby is born. Simply delightful! Source: Moroder, Wolfgang. 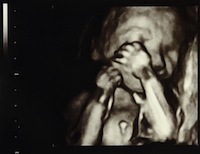 “Fetuses Yawn in Utero / Video.” LiveScience. Tech Media Network. Nov 21, 2012. Web. Dec 30, 2013.